Sometimes I get the point of naturalism. The majestic and heroic characters of the romanticism are sometimes tiring. In not few cases, these kind of paintings cross a line and become pretentious and artificial… “pompous” would be the exact word. And I guess something like that would have thought the Norwegian Christian Krohg, who resolved to paint common individuals inside the activities of everyday life, whether in work, or walking on the street, or in a social meeting. But the aware reader of the blog would ask: “and why this kind of painting would be naturalistic and not realistic?” Excellent question! Although they are very similar, there is a key difference: naturalists prefer to documentarily represent lower social classes, instead of painting historic motifs as the realists. In Krohg’s work, the most important are the individuals: prostitutes, fishermen and homeless. 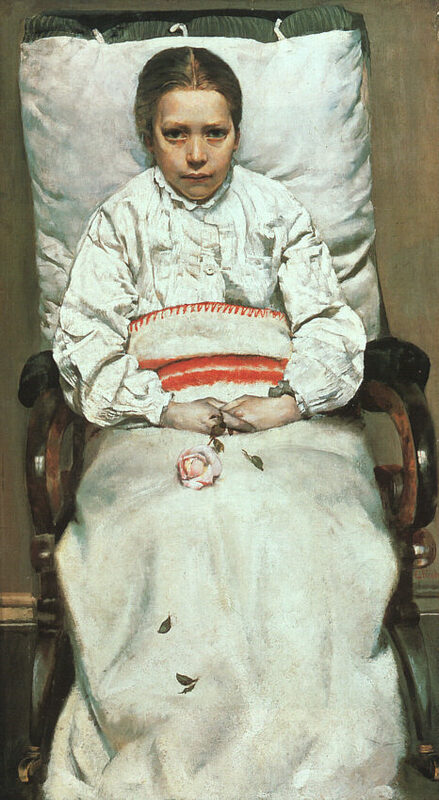 Sick girl is a sad painting. Too sad. I always say that art should move the spectator, but this seems too much. The girl looks at me with weepy and tired eyes. They are red, maybe a symptom of the disease she is suffering. I think that, the look, per se, doesn’t say much. But her expression is… sublime. It seems like she is scared. Like a boy tripping over a rock: the tears are not from the pain itself, but from a sudden fright. And, to be sadder, the rose she is holding, also convalescent, slowly losses its leaves over the girl’s dress. ~ by Álvaro Mazzino on August 18, 2010. Theming is really fun, and I love changing the way my phone looks every couple of days. This isn’t unique to HTC, of course—it’s easier here, maybe, because there’s a dedicated app and community, but there’s nothing here you can’t do elsewhere. If you missed your micro SD slot on your Samsung Galaxy S6, then you may need to add the S7 to your wish list, as it is speculated that the S7 will be bringing back the option of swapping out your storage. Typically, a person who wanted to sell items would have to make an appointment with a consignment shop, in which they would have to physically bring in clothes and accessories for appraisal. This entry was posted on August 18, 2010 at 09:51 and is filed under Naturalism.You can follow any responses to this entry through the RSS 2.0 feed.You can leave a response, or trackback from your own site.